Several eye-witnesses of the March 11 M9.0 in Japan have posted chilling first-hand footage of their experiences. The following two videos document the entire disaster, from the shaking until deep into the tsunami. First, here’s the harrowing video taken by a professional storm chaser who happened to be in Otsuchi, Japan doing volunteer work for Save Japan Dolphins when the earthquake roared along the coast. He struggles to keep his balance at the tail end of the earthquake, then they hop in their car and spend eight precious minutes fleeing to high ground with the rest of the alarmed population. These guys are clearly professionals; they have incredible composure. As they navigate their way through town you hear radio correspondence with a second car behind them full of other dolphin activists, the Sea Shepherds. While the tsunami roils its way into the bay from the open ocean, the water level creeps up and floods the seaside industrial buildings. As usual with footage of the tsunami, it keeps on coming, getting higher and higher against all belief. This next video is unprecedented: a high-def dashboard camera in a bus records the entire event, most of it from in/on the tsunami! It was recently recovered, and we get to witness its journey. It would be marvelous if someone who knows Japanese could do a little translation of this report. Watch this; the following text is a spoiler. It’s incredible to watch as the bus helplessly bobs with mounds of urban flotsam, but the literally immersive perspective reveals fascinating gradients in the velocity and height of the tsunami’s flow as it rages through city streets. The bus seems for a while fortunately stuck in an eddy behind a huge concrete building… until it gets entrained in a rapid flow and slammed up against something, at which point debris pierces the windshield, water rushes in, and the camera dies. There’s at least one more street-level recording of the tsunami pouring into town. Once again what begins high and dry ends up so far below water it defies imagination. So many videos of the March 11 M9.0 Tohoku earthquake and ensuing tsunami exist that collecting and disseminating them is a daunting task. In my three earlier posts on the subject I referred you to a variety of perspectives of both events (the quake and the tsunami). Since then plenty more clips have emerged, and continue to. I’ll make an attempt to guide you to a few of the more spectacular or interesting ones; the rest can be found through potentially endless browsing among the chain of “related videos” on YouTube. The following surveillance video is one of the few that I’ve found recorded from a well-mounted stationary camera, removing the shakiness of handheld cameras that makes it difficult to discern real ground motion. As the camera remains strongly braced against the ceiling/wall, we can much more clearly see the motion of the contents of this building as it sways in the quake. The footage is from a 5th floor office in Koto Ward, Tokyo. Note the duration of shaking–over two minutes!–and pay attention to changes in the direction of shaking. The two most remarkable aspects of this footage are the variability in direction and intensity of shaking. The shaking we observe doesn’t reflect true ground motion, but rather the building’s response to that force from below. The building twists and wobbles as it’s shaken from beneath, perhaps adding to the fluctuating intensity of the shaking. The large source area of the earthquake (a huge patch of the subduction interface that ruptured) also contributes to the fluctuations in shaking as waves from early in the earthquake bounce around beneath the city and interfere with incoming waves from the later parts of the rupture. Shaking intensifies as it proceeds, likely representing both the interference of old and new waves and the gradual approach of the earthquake wave source southward as the rupture propagated down the coast, closer to this building. The next clip was filmed outside and only coincidentally captured the quake, unlike most of the others in which people had enough time to run and grab their cameras. Here a couple of young American tourists witnesses the quake in a Tokyo park. The rustling trees and alarmed birds provide a glimpse of quakes sans humans, while the warning siren adds an eerie gravity to the situation. All of the videos of the tsunami I have seen are powerful, terrifying, and staggering to watch. Here are a few Japanese videos of it pouring into coastal harbors on the northeast coast, filmed from shore-front office buildings. The most astounding part of these videos is how quickly the surge in sea level overtakes the seawalls and surges inland. It happens so quickly and easily it seems almost calm, belying the utter violence of torrents of water pouring into the city streets. The tsunami easily overtakes the seawall in Shiogama, and the warning siren adds a chillingly stoic urgency to the unfolding disaster. “This is really happening” is the message I get. Another video from just down the pier in Shiogama, where passenger ferries wait at a floating boarding platform. This video is filled with markers to indicate how high the water rises–watch especially the loading ramps and the bottom of the 2nd or 3rd floor balcony the videographer is standing on. [Updated 4/18/11 10:35am]: Here’s a 3rd video of the tsunami overtopping a seawall, this time in Kesennuma port. The utter devastation wrought by the tsunami surge is plain to see here: it destroys absolutely everything in its path–everything you think it might wipe out from the beginning of the video… it does. This is how you end up with those scenes of utterly razed coastal towns. I can’t imagine this cameraman wasn’t utterly fearing for his life. Below is yet another unbelievable video of the tsunami swelling into Kesennuma. This one is chock full of massive ships being swept through town, and like the other ones it shows the sea continue to flood inland to an astonishing depth. This next video is a long one (~10 minutes), but well worth watching to see the full beginning of the tsunami unfold. There are fascinating eddies, currents, and surges to watch interact; you see how easily boats can get tossed around; and believe me, it doesn’t get truly intense until the end, even after you thought the worst was past. It’s like the first quake video above: don’t be fooled by the duration or waning intensity of the disaster at hand. In both cases it just gets worse and worse. I have hardly referred you to a fraction of the videos out there, so if you’re in awe of these there are plenty more to be found by clicking through the related videos on YouTube. As you watch these videos that bring you closer to the scene and evoke some vicarious experience of the terror, do consider the plight of those millions displaced; there are links to major aid organizations in the right-hand panel. There have been plenty of doomsday claims circulating the internet in the wake of the massive 9.0 “Tohoku” earthquake–lots about supermoons, some about dead fish, some merely about some alleged “pattern” of recent quakes circling the Pacific, a pattern generally conveniently selected to only include earthquakes that have hit the news. I won’t bother to give any of these claims too much credence by linking to them here, but they’re easy enough to come by. Fortunately there are some scientifically grounded explanations as well, like this editorial by USGS seismologist Susan Hough. The bottom line with claims about patterns of earthquakes and predictions for the near future is that for them to be of any value, they have to predict quakes better than random chance. In other words, it’s easy to “predict” that there will be a significant earthquake on the U.S. west coast–we have earthquakes here commonly! A prediction needs to be precise in space, time, and magnitude to be of any value beyond the forecasts we have developed already to understand earthquake hazard. 1) If you live in a quake-prone area, you’ve had a pretty high risk of such earthquakes all along–is the prediction precise enough to make a difference in your preparation? 2) As Susan Hough points out, very few predictions precede large earthquakes, but plenty of large earthquakes precede predictions. Renewed awareness of quakes inspired by a devastating event tends to foster the anxiety that faux-predictions thrive on. In that second vein, it’s important to remember how many earthquakes are going on around the world all the time. Most of the largest ones occur far out to sea, deep beneath the ocean’s surface. There’s nothing special at all about Christchurch’s 6.3 except that it hit directly below a city. There are scores of others like it every month. Don’t be fooled by “connections” like that; in fact it’s valuable to check the USGS’s “significant earthquakes” page for reminders of just how many large and/or devastating events have occurred within recent memory. Other than that little spiel, there’s plenty I’d like to pass on regarding the information and news pouring forth from Japan, but I have limited time as I prepare for two weeks of field work in Mexico. Some other bloggers are doing a great job compiling information, and their posts are well worth mining for informative tidbits about the quake. Notably, the Shaking Earth has a collection of resources, and Chris Rowan at Highly Allochthonous posted an earthquake round-up with links galore. There are some neat–if somewhat disconcerting–liquefaction videos coming out of Japan, but I’ll devote a later post to discussion of these. 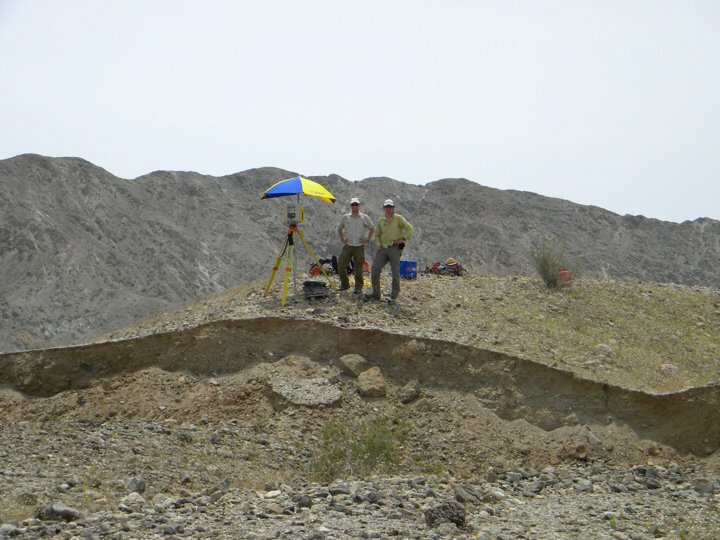 I’m off to the borderland of northern Baja, Mexico for two weeks, to re-survey the escarpment left by surface rupture of the 7.2 earthquake there last Easter day (pictured in the banner of this blog). I’ll come back with pretty pictures and info about that fascinating rupture. Myself and fellow UCD grad student Peter Gold surveying the fresh April 4, 2010 El Mayor-Cucapah earthquake rupture with a terrestrial LiDAR scanner last spring.